Resources tagged with "family friendly"
A case study of Hans Christian Andersen's Snow Queen for the Xbox generation. If you're stuck for family friendly resource ideas then this case study may help. It outlines the year round, permanent provision newly implemented at three organisations who had families as a key target market. You'll find details about the resources along with findings from the qualitative evaluation which was undertaken to monitor the success of the implementation. BCMG created a family friendly policy that in turn enabled the organisation to strategically enhance its family and youth oriented programming. Out-of-school creative participatory workshops for young people conclude with sharing opportunities for parents and friends. Families are offered front row seats at concerts, and have a specially designed concert programme with specially briefed stewards, more audience participation (before, during and after the performance), more flexible ticketing and a range of other innovations. Following a number of years of campaign and product development, the Family Friendly project has undertaken a full strategic review. With the development of an audience focused approach at its heart, a series of venue-based case studies explores how to create a family friendly venue, increasing and improving family provision, collaborative marketing, and taking the family friendly concept into tourism and cross-sector areas. Assessing the Family Friendly campaigns led by Arts About Manchester, the report analysed the campaign elements, e.g. a qualitative assessment of print and information, welcome and staff, and promotions. The future direction of Family Friendly as a strategic campaign was also reviewed through its performance in achieving its objectives of increasing the volume and quality of family visits (for the whole family), and encouraging new and year round provision. Assessing the Family Friendly campaigns led by Arts About Manchester, the report assessed not only the campaign elements (e.g. a qualitative assessment of print and information, welcome and staff, promotions) but also drew on wider research into the behavior of families in museums. 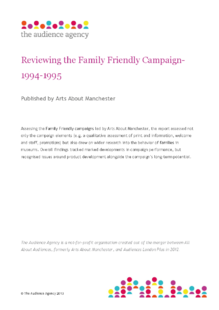 Overall findings tracked marked developments in campaign performance, but recognised issues around product development alongside the campaign’s long-term potential. A series of website screen grabs showing the use of branding, tone of voice, design, content and product promoted through the Family Friendly campaign online. The blend of what’s on and a focus on activities with the opportunity to join the Family Friendly mailing list is evident, building around a calendar that targets family peak times, e.g. weekends, half-terms and holidays. The Family Friendly campaign developed a tourism element to enable Greater Manchester to develop and strengthen its brand across cultural and leisure sectors within a 2 hour drive time of Manchester. The aim was to attract new UK visiting families, especially short-break takers and day visitors. Seasonal, targeted campaigns worked with transport providers, the tourist board, city centre management, accommodation providers and key venues through joint promotions, even with its own family friendly visit hotline. Initial evaluation provided a detailed set of recommendations. As one of the culminating elements of the initial Family Friendly project with museums and galleries, a conference explored experiences and insights to date and latest thinking. This included a framework for family learning, interpretation and activities for families, developing family friendly resources, cross-team working between educationalists, marketers and curators, and evaluating family resources and visitor involvement. A set of 5 key principles were defined, focusing on experience, social and physical interaction, provision across age bands and commitment to families. Looking at how a small museum investigated ways to encourage and engage visits by those with disabilities. The resulting free, interactive multi-sensory room linked to the wider public programme and enhanced a family friendly offer. Audience research informed the process and the resulting ideas evolved into a phased development to maximise limited resources. The practicalities of the new resource were assessed through further visitor research, which has informed the development of the content of the room and the duration of visitor sessions. Creating and strengthening relationships with existing and potential family audiences is the key to building child/family friendly arts venues. This short, practical guide details three key steps to make progress: Understand the concept of family friendliness and how it applies to arts Look at venues from a child and family friendly perspective and assess its strengths and weaknesses Identify what needs to be done to become more child and family friendly and develop plans for action. This guide summarises the contents of a family friendly forum which took place in February 2011 where ideas and learning around family friendly initiatives were shared. You'll find a checklist of things to think about when programming for families, useful family friendly partner organisations and links to case studies from the participating organisations who shared their success stories. What makes a successful family friendly event? We're often looking for creative ways to attract low or unengaged audiences into our venues. This family friendly film festival aimed to introduce new families to cultural venues which they may not have normally visited, by creating an exciting, affordable holiday experience. Running in summer 2010, the festival showcased films and activities across twenty different arts venues around Greater Manchester. This fact sheet provides a snapshot of the key learning points and headlines from the project evaluation, outlining top tips for how to make a really successful family friendly event. This family friendly film festival aimed to introduce new families to cultural venues which they may not have normally visited by creating an exciting, affordable holiday experience. Running from the 30th July - 5th August 2010, comprising 52 events at 20 venues in Greater Manchester. The festival showcased films and activities across twenty different arts venues around the city and beyond. Developing approaches to engage with diverse audiences, specifically disabled audiences, Black and Minority Ethnic groups and lower socio-economic groups. This study explains the motivational and functional drivers that can stimulate demand, alongside barriers to engagement and how to overcome them. A holistic organisational approach supported by a range of tactics is recommended, drawing on practical examples and case studies. These include proactive socialising, family-friendly, building partnerships and targeting investment in order to build meaningful engagement. This research presents an audit of ‘family friendly’ work across the arts and cultural sector. It brings together key information in relation to families and ‘family friendliness’ work, examining models of best practice. You'll find a literature review of family friendliness across the cultural sector, an outline of gaps in knowledge, understanding and practice plus suggestions for developing more inclusive and accessible practice in family friendly approaches. These minutes from the Family Friendly Forum give an over view of discussion around using social media to talk to family audiences. The key points discussed are that not much research is available on how families use social networking, that it’s all about communicating not selling, and that some further action is needed to develop common twitter has tags and ways of highlighting useful content on facebook. A case study about research done by the Science Museum Group into the needs of young visitors and their families at the National Railway Museum. Research consultant Heather Maitland was engaged to undertake the research to explore how family friendly the museum is. She conducted observations and interviews with families and most importantly, with the children.